Do you ever have those times when something is very different from the familiar, but also so perfectly right that you wonder why no one else sees it that way? Like when you’re perusing YouTube and come across a song you kinda like, but then you realize it’s a cover, and the new direction adds the right bit of flavor that makes it so right? Or when you accidentally put jalapeno jelly on your peanut butter sandwich, but realize that it was the best mistake you’ve ever made? Stop judging me! While your specifics might be a little bit different, you’ve experienced that feeling, right? Right?! Well, I had one of those moments while searching for cover art for a video series I was making. I needed a painting from the Oracle games, and I really wanted it to speak to me. I poked around online for a few days trying different searches and going through several talented artists’ portfolios, but due to the criminally underrated nature of both Oracle of Ages and Oracle of Seasons, I just wasn’t finding anything that seemed to capture the feeling I’d had while playing through those two Zelda titles. Until I happened across the DeviantArt page for HaxPunch and found this. I saw it, blinked a few times, and knew I’d found what I was looking for. It’s so different, but man it’s so right. Now, I love this painting, and I think I know why. I love it because it’s simple. 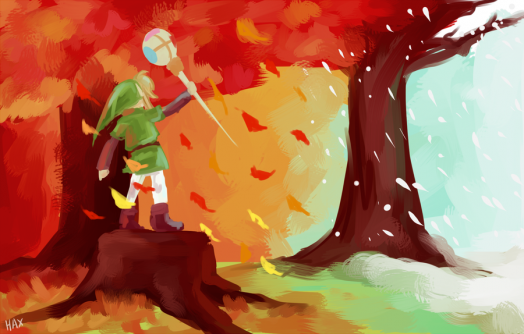 It’s a simple, storybook representation of Link standing on a log calling upon Din’s power to control the seasons. It almost feels impressionistic, where it focuses less on the accuracy of the scene and more on the feeling it creates. 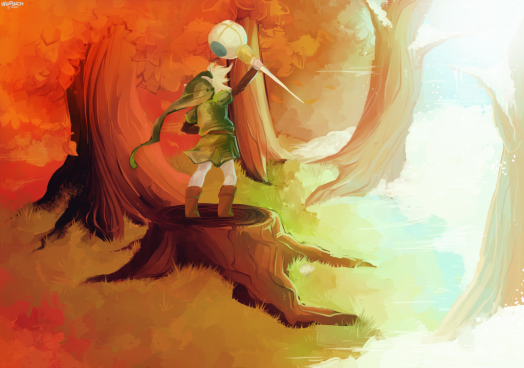 I can almost imagine stumbling into this small clearing to find Link halfway through his evocation. It’s almost like it’s pulled directly from the idyllic childhood fantasy world of Calvin & Hobbes. I also love it because it’s not simple. It’s a clever idea to have the seasons change from Fall to Winter as your eyes move from the left side of the painting to the right. How the warmth changes to brisk chill. If you ever asked an impressionist painter if they thought their art was simpler than their non-impressionist peers, they’d tell you that their art is definitely not simpler. It just has a different focus. A difference that focuses on feelings and impressions rather than accuracy. And because I love you, I thought I’d compare the first picture with a repainting of the same scene by the same artist. Wow! What a difference a few years of practice and honing can make on an identical idea! I also love this one, but for completely different reasons. While it loses some of the magical simplicity, it gains depth and action. While the first conveys a feeling of general warmth, this one whips you along in the literal changing of the seasons. It’s more polished, more sleek, more fantasy, and more refined. I kept trying to pick only one to feature today, but I just couldn’t do it. It really feels like I’m comparing two masterpieces side-by-side. Maybe you’ll have better luck.